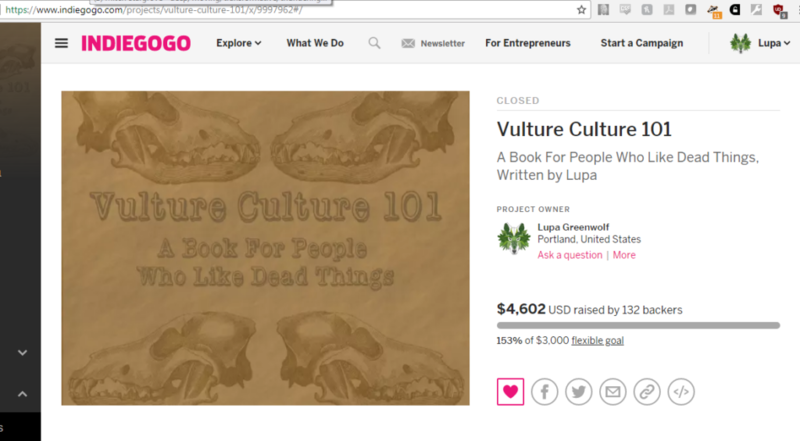 HUGE thanks to everyone who backed the Vulture Culture 101 IndieGoGo Campaign! We ended up raising $4,602, which is 153% of the original goal. We managed to reach the first stretch goal of skull stickers, and though we didn’t make the second goal of animal skull flash cards, I’m still planning to release those independently later this year. What’s next? I have a few finishing touches to put on the manuscript, and I’ve already selected essayists for the tutorials on tanning, bone cleaning and the like. Provided everyone can get their essay in on time, I should be on track for my Summer 2018 release of the book. In the meantime, I’ll be working on the extra perks for my IGG backers, book cover design, and other details. And again, thanks to everyone who backed, shared and otherwise supported this campaign! Previous Previous post: IndieGoGo Ends Saturday!